Need some awesome meal ideas for cooking in your van? 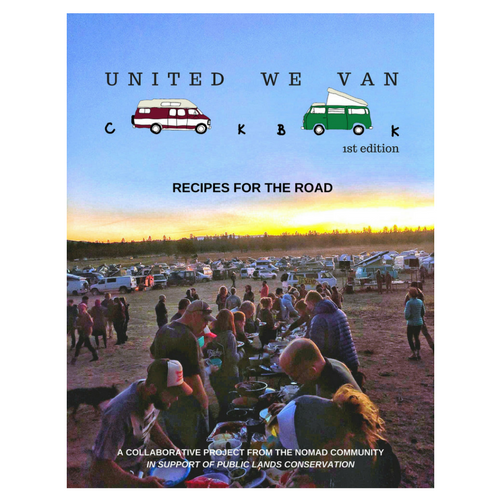 The United We Van ebook cookbook features over 40 delicious recipes from experienced vandwellers. From appetizers, salads, and stir-fries to tacos, hearty plates, and beverages, this cookbook is packed full of mouth-watering recipes to help you eat well on the road. We donate 100% of the proceeds to awesome organizations that help conserve the public lands that we all live on and enjoy. Proceeds from this project benefit The Nature Conservancy. The cookbook comes as an ebook .pdf download.